What does it mean to design a bathroom? Whether you’re completely renovating it or changing a single piece, your bathroom is a place you think about from a practical and functional lens. But what if your bathroom no longer needs to be basic and boring? You can easily add a designer touch to up the glam quotient in your bathroom! Statement bathrooms are a reality in many homes now. Why? Residents are realising that it’s where we spend time as soon as we wake up and right before we sleep for the night. How you feel in this space matters. Getting a statement bathroom doesn’t necessarily mean renovating the entire space. Sometimes, just changing, replacing, plumbing and adding new pieces can work wonders! Here are seven, clever decorating ideas to help make a statement with your bathroom. Gone are yesterday’s beliefs that gold and silver do not belong to bath spaces. In fact, metallics are all the rage – and are topping the decor charts. This lustrous palette lends not only an intriguing contrast, but also adds a visual treat to your bathroom with character and texture. All you need to remember is keeping the balance. Build your confidence by starting small; it may be as simple as introducing a washbasin with a dash of gold. Buy here: Gold or silver Washbasins from Grohe, Kohler, Jaguar and the like. You can also visit bathroom fittings stores in Kirti Nagar and Kotla Market in Delhi, A to Z – Bed N Bath and The Bath Shop in Mumbai. Transform your everyday washroom space into a serene tropical oasis with printed wallpapers. Bathrooms no longer have to be fully tiled to withstand humid conditions. The market is loaded with wallpapers that are durable and splash-proof. Also, there’s no need to cover every wall, just go for one. Try avoiding accessories and keep the room light, airy and without clutter. Buy here: Devon & Devon is available through FCML and Keha Casa stores across India. Like they say, every room needs a hero, and your bathroom is no exception. Upgrading the look of this room is easy with vanities and washbasins. Being functional, basins create a style-steal centrepiece in this space. Opt for an interesting shape or an unusual hue for an otherwise plain bathroom. Make sure that you’re making a bold statement by choosing one which provides a stark contrast. Let the drama flow to wall mirrors and storage. Buy here: Olympia Ceramica is available through Etre Luxe in India. Yes, we know that bathroom flooring needs a strong foundation that’s both durable and water resistant. Ceramic tiles are the best choice for bathrooms, and have been accepted globally too. But why go the beige way? Choosing interesting or unexpected patterns on flooring will create a lively, chic and polished finish. Floors in granite or polished concrete are sure to create a dramatic effect. Buy here: Similar looking tiles can be sourced from ceramic brands like Kajaria, Somany, H&R Johnson amongst the others. The versatile combination of black and white will definitely pack a punch and create design schemes with real impact. It also has timeless appeal. When decorating a bathroom, the starting point is usually the white walls and floor, so you are already halfway towards creating a monochrome scheme. Now consider a striking black washbasin and bathroom furniture to create the impact. If budget is a constraint and you don’t want to invest in bigger pieces, opt for plain white or black tiles and get it installed by local contractors. Buy here: You can easily source White or Black bath fittings. For black furniture, visit brands like Vitra, Roca or Hindware. Coloured bathtubs and basins are making a huge comeback, but in bolder shades than you can imagine. An ideal way to add oomph, it will give your bathroom a bit of character by adding a splash of bright colour. Maintain the balance by choosing accessories in a subtle or white shade. Buy here: C Tribhovandas & Co is available through leading building material stores across India. 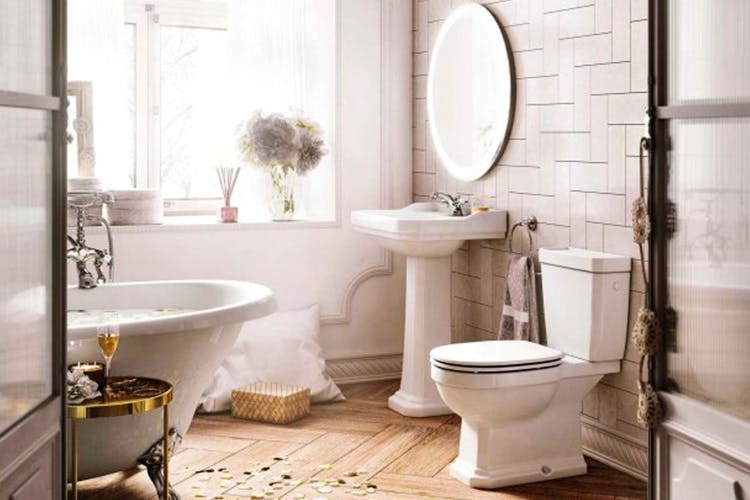 Packed with character, a classic-style bathroom continues to be in vogue and work just as well in a big or small bathroom. Choose one statement piece, such as a striking washbasin or claw-foot bathtub, to make it the focal point and add an all-time favourite white colour scheme for all the functional pieces. Another clever approach is choosing naturally-finished wood furniture for this space that will lend a down-to-earth feel. Buy here: Roca is available through stand-alone stores and leading bathroom stores across India. This recommendation was first posted on Urbanclap.